Kevin Kölsch & Dennis Widmyer direct this new adaptation of Stephen King's classic novel. When Rachel (Amy Seimetz) and Louis Creed (Jason Clarke) move from the hustle of Boston to the rural quiet of Ludlow, Maine they expect their lives to slow down so they can finally spend some quality time with their children, nine-year-old Ellie (Jeté Laurence) and two-year-old Gage (Lucas & Hugo Lavoie). However, the new house in the woods comes with an extra thirty acres of mysterious forest in which a sinister ancient power lurks. When tragedy befalls the family, a father's grief awakens a malevolent entity that won't be satisfied until it consumes them all. 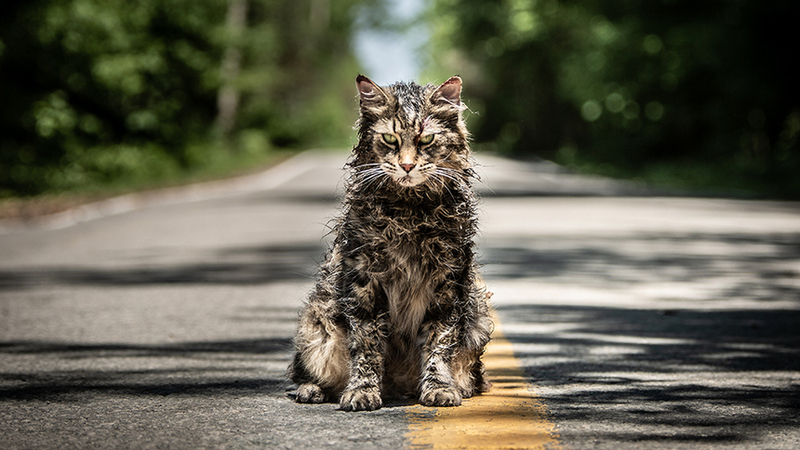 One of Stephen King’s darkest and most terrifying stories gets a facelift in Kevin Kölsch and Dennis Widmyer’s new adaptation of the 1983 novel, Pet Sematary. The story was first brought to the big screen in 1989 by music video director Mary Lambert, resulting in one of the most frightening feature adaptations of a King novel at the time. While that film definitely feels the ravages of time with uneven performances and some lackluster execution in the technical departments, it still packs a punch and delivers some great scares. The update definitely improves upon its predecessor’s technical deficiencies, delivering a more polished product with solid atmosphere and top notch acting performances, but sacrifices a huge segment of what made the first film work by shifting around some key characters and events in an effort to deliver an “elevated” experience. Widmyer and Kölsch’s Pet Sematary is a very different beast, and one whose significant changes from the both the source material and previous adaptation are definitely to the detriment of the film, leaving the audience with little more than a few successful frights where a real exploration of grief should be. From here forward, there will be several minor spoilers, but nothing that hasn’t been explicitly shown in trailers or other marketing materials. Reader beware. Shortly after settling in, young Ellie discovers a burial ground in her own backyard in which the locals have interred their pets for generations. She’s met there by kindly old neighbor Judson Crandall (John Lithgow) who explains to her that the cemetery is a reminder of the good memories these pets and their owners shared, but Rachel, who has her own complicated relationship with death, is less convinced of its harmlessness. When Ellie’s beloved cat, Church, wanders into the road and succumbs to one of these speeding tankers, Louis and Rachel decide they aren’t ready to discuss death with their daughter and Jud offers up an alternative. There is a place beyond the pet cemetery where “the dead walk”, and Jud and Lois decide that to avoid heartbreak, they’ll bury Church in that part of the forest. Surprisingly to Louis, it works, and Church returns almost immediately, but he’s not quite the same. So, when Ellie wanders out into the road and meets the same fate, Louis decides that he’s not ready to say goodbye and – while Rachel is out of town with Gage attempting to put their lives back together – he takes her to the same ground, and she returns with similarly odd and sinister results. Ellie is back, but she’s not quite Ellie anymore, and even though Louis can see that she’s changed for the worse, he’s blinded by his own grief and attempts to assimilate to life with this new version of his daughter, leading to some a few creepy and awkwardly humorous moments of Daddy-undead daughter bonding. Rachel returns after a few days and discovers her dead daughter walking around and promptly loses her mind, a completely appropriate response. However, it becomes quickly apparent that Ellie isn’t interested in being one big happy family the same way her father is, she has other, more diabolical plans. The most startling change from the original Pet Sematary book and movie is the fact that in both of those the child who dies is the toddler Gage. By switching the victim/killer to Ellie, the directors have another full character to work with, and while that may seem like a good thing, what it does in practice is essentially create a slasher in which a child is killing her own family for kicks, rather than an innocent pre-verbal toddler who is at the mercy of the evil forces controlling him. The reason the first film worked so well as horror was the fact that Gage was too young to effectively verbalize complex thoughts, making his murderous rampage a kind of children’s game that he was playing with his victims. While he was definitely being controlled by a malevolent force, it was all a game to him, making him all the more unpredictable and scary. With Ellie as the antagonist, there’s a lot more talking and a lot more explaining of the emotional context that would be better left to the audience to decipher on their own. Ellie seems to be in control, Gage was an evil puppet controlled by an unseen demonic force. For me, the choice is easy, the unknown and unexplained is far scarier than a killer who seems to be executing a vendetta. The thing is, almost everything about the technical aspects of the film is an upgrade. Jason Clarke and Amy Seimetz act their butts off as these two complex characters each attempting, and failing, to deal with their own grief. Even though I dislike what Ellie becomes, there’s no denying that Jeté Laurence delivers a great performance with the material she’s given, I just think that what she’s given doesn’t work. The photography, the music, the sound design, the production design, the effects; all of it has the benefit of talents directors and thirty years of advancement in filmmaking craft to create a new and improved version of a terrifying story. But it fails. One of the oddest choices made by this new team was the decision that what Pet Sematary, an immensely dark story that at its core deals with the intense grief of losing a child, needed was more laughs. In several instances the filmmakers insert awkward feeling sight gags to punctuate the idea that what Louis has done by reanimating his dead daughter was a bad idea, as if that weren’t obvious. In one sequence, immediately after zombie Ellie returns, the two lay down to go to sleep together and the camera lingers on them side by side in bed with Louis laying perfectly still with his eyes wide open as if to say, “this is a fine mess I’ve gotten us into”, eliciting gales of laughter from the audience at my screening. This kind of sight gag happens with almost the same frequency as the moderately successful jump scares. Not the kind of thing that makes for effective exploration of the trauma induced by a death in the family. From this point on, the film makes sillier and sillier decisions when it comes to what happens next. There are numerous little in-jokes in which this film acknowledges the existence of the first film by lingering on a shot here and there that fans would recognize, only to take a quick left turn and deliver the same punchline, but to a worse joke. It’s frequently baffling with it comes to tone and what exactly its villain is trying to accomplish. I know a lot of movie goers are going to enjoy Pet Sematary, and even a lot of horror fans will appreciate it. However, I have to say that in spite of improving on every conceivable technical level, this new version of Pet Sematary fails spectacularly in the one department that really matters with a horror film, it’s just not that scary, and certainly nowhere near as scary as Lambert’s version of the film. This film makes bad decisions one after the other throughout the third act that had me rolling my eyes by the time the credits rolled to the strains of a watered down version of the classic Ramones theme song. Sorry, I don’t wanna be buried in this Pet Sematary.